Most of our Friday Night dining group had just returned from the Bahamas where they were stranded as a result of the two-pronged snowstorm that dumped almost 4 feet of snow in our area over a 5 day period. They got to see none of it. They were weary from snorkeling and lying on the beach and not ready for a night out. My wife, Kathy and I grabbed a bottle of Blockheadia Zinfandel and drove to our closest BYOB, the not fancy, but reliable, A & S Restaurant. There is something to be said for a little place, close to home, where you can be assured of a good meal at a very reasonable price. Kathy started with a house salad while I had a cup of the cream of broccoli soup. The warm garlic bread and the soup was a great start to the meal. It was warm and cozy inside and the place was decorated with a Valentine’s Weekend theme. Our server, a young man named Uriel, was both attentive and unobtrusive. The menu at A & S is not extensive but the have enough pasta, veal and chicken offerings to force you to make choices. My choice this evening was the Chicken Romano. 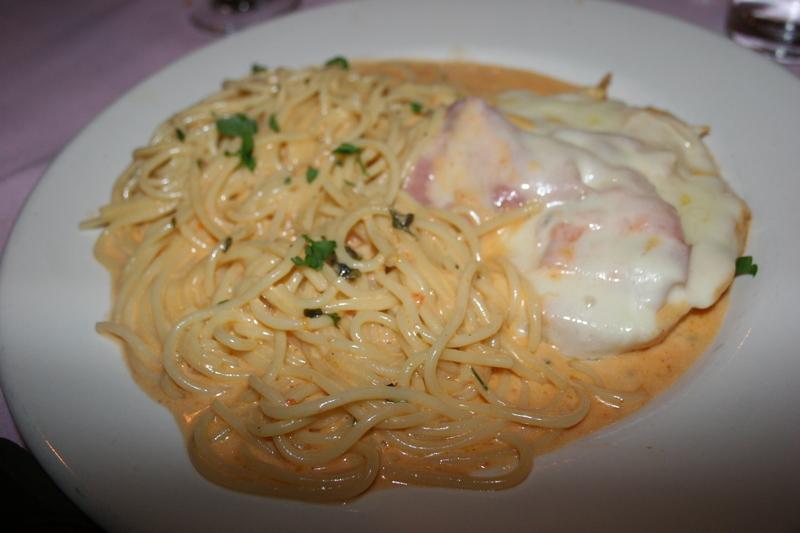 Two nicely done, good size pieces of tender chicken breast topped with plenty of ham and lots of cheese served with spaghetti in an excellent blush sauce. Had I not been so hungry there would have been enough to take home but it tasted so good that each “just one more bite” led to another and before long the theme became ” ahhh not enough for another meal.” It really was enjoyable. Kathy chose from her favorite food group, the always popular (except with me) eggplant. In this instance, it was the Eggplant Rollatini. 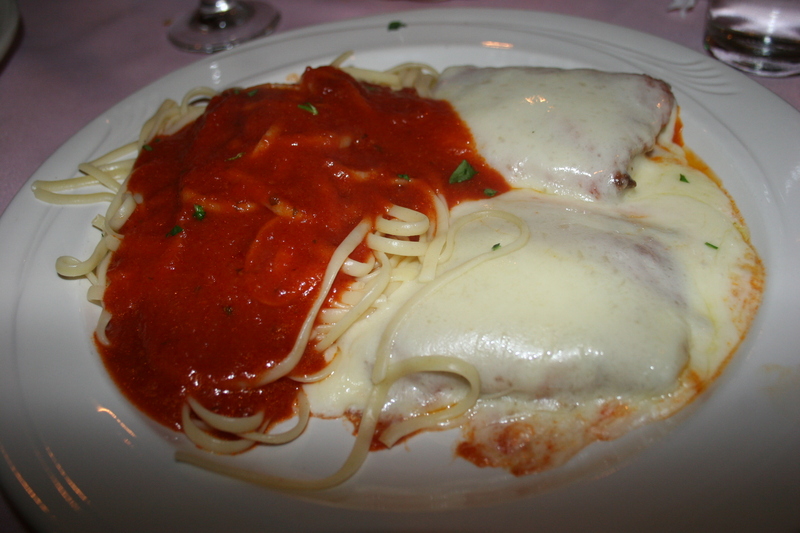 Two generous portions of eggplant topped with mozzarella cheese and served with a side of linguine topped with marinara sauce. Neither of us had room for dessert despite the fact that the “Specials” board was listing quite a few tempting choices. And the bill for this meal, a soup, a salad, two delicious entrees? We have certainly spent $100 as a couple for lesser food. This wasn’t $80, or even $60 ( I sound like the guy on the infomercial….”but wait, there’s more!”). It wasn’t $50 or even $40. Our total tab, including tax, excluding tip, was $27.00! I can’t tell you the exact location of A & S because if word gets out we won’t be able to get a table there on Friday nights. We did promise Uriel, our server that we would get his picture into the blog so, here he is, you can find him and ask him for the address!